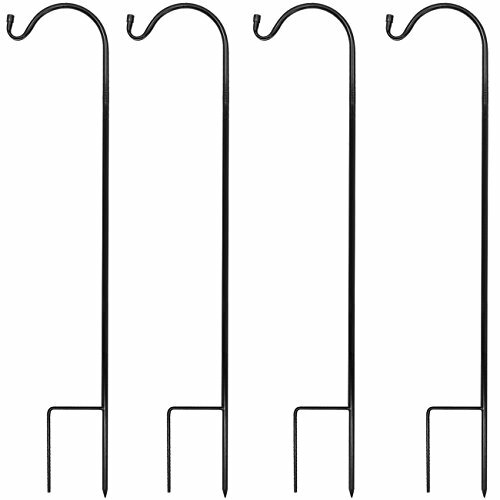 Create the garden of your dreams with Sorbus® Set of 4 Shepherd's Hooks! Each hook includes 3 extenders for four height options. The hooks can measure up to 36.5" depending on what you would like to hang and how much you would like it to stand out! These hooks are constructed of durable steel to provide stability and lasting quality to withstand many seasons. They are also made to withstand strong winds without the worry of weather affecting the object hanging from it. Now, you no longer need to worry about hanging potted plants, flowers, lights, or feeders! These shepherd's hooks will create a beautiful outdoor scene for any occasion. This allows you to save time and messy clean-up by knowing that these hooks (once properly planted into the ground) can stand alone! The hooks are also collapsible to 17.5" when limited height space is available. They can be used to decorate weddings, anniversaries, outdoor backyard parties, festival, and more! Hooks can be used for professional or at-home lawn decoration. They vary in height depending on how many extenders are used - options include: 17.5" - 26.5" - 36.5" in height. Package includes shepherd's hook, extenders, and stakes. Whether you are decorating your lawn, setting up a backyard barbecue, or arranging a beautiful wedding these hooks can make any occasion all the more enchanting! HEIGHT ADJUSTABLE - Each hook has 3 extenders for different height options: 17.5" - 26.5" - 36.5"